Laure Aubert is a landscape architect working in Germany who attended the 2011 IFLA Congress in Zurich. Laure interviewed various Congress attendees which we will feature over the next two weeks. Bruno Marques is responsible organizer of the upcoming EFLA Regional Congress “Mind the Gap. Landscapes for a New Era”.and answers on behalf the Estonian Landscape Architects‟ Union. The EFLA Regional Congress is being held in Tallinn-Estonia, from 2-4 November. 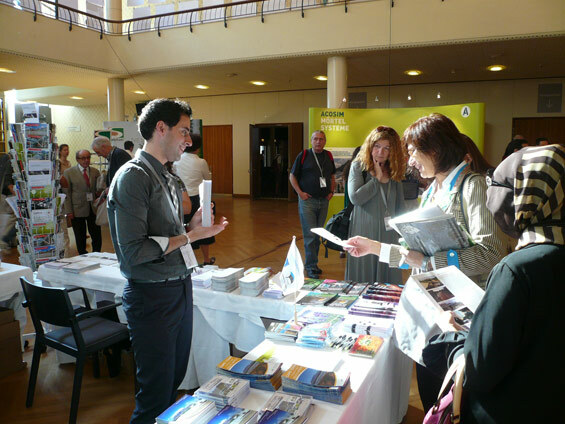 Why was it important for you to attend the IFLA Congress? The importance of attending the IFLA World Congress in Zürich relies in the biggest event of our profession that gathers professionals from all over the globe, with different backgrounds, different cultures, but at the same time connected by only one thing: the profession. I think these events are really important, for one hand to learn something new and to see what exciting has been done over the last years in the field, for other hand to reunite with friends and colleagues. In Zurich, I especially enjoyed the amazing organization, the wide range of events and above all, to see lots of students. That gives me some trust that our profession will continue to exist and develop in the future. What were your best moments? Do you plan to attend the next congress? funny music and people really enjoying, the technical tours…well several things will be in my memory for a while. I’ve big intention to go to South Africa. Let’s see, it’s a bit early to think about that. For now I need to be focus around the EFLA Regional Congress, the most important European event in Landscape Architecture. What is for you noticeable in the Swiss landscape architecture? Hills, lakes and organization. What amazed me the most on the Swiss landscape was the green infrastructure. It was wonderful to explore around and see the good job in planning and design that the swiss landscape architects have done in the country. What are according to you the important current landscape issues? Well, there are several and is so specific in each country. Above all, I think is important to defend the implementation of the European Landscape Convention, in order to protect our natural patrimony and culture. As well, to work together to develop the International Landscape Convention. That is a great project bringing together the worldwide nations to protect our landscapes. At the European level, we need to defend our profession interests, from the education to the professional practice, working together with EFLA. Can you describe the place/landscape design you like above all? something you discovered or you designed ? There are several examples. In Switzerland I loved to see MFO Park in Zürich Oerlikon. It was a wonderful example how to re-use a structure, keeping the previous identity and developing into something attractive and useful. In Estonia, there are similar examples. For example, the Rotermanni quarter, a previous factory area that now is totally renovated. The designers preserve the previous identity everywhere: from materials to furniture. What would you say about the landscape architecture field in your country ? In Estonia specifically, lots have been done but still there is lots to be done. Being a young profession in Estonia, landscape architecture has been making really solid steps. At the academic level, universities made a huge effort to upgrade their curricula, together with EFLA. This means we are creating professionals more conscious with the profession and problematic. At the professional level, the Estonian Landscape Architects’ Union has been doing just great. We were able to get acquaintance by other professionals; we try to establish partnerships to continue with the development and protection of our landscapes. Right now, we are dealing with the improvement at the professional practice and recognition level. And the most important, is to show at the European level our results. Big improvements were made in 15 years, and especially after the re-independence and entering in European Union. We are proud of what we accomplished. And the results we want to show them during the EFLA Regional Congress, in Tallinn-Estonia, from 2-4 November. Thanks to Laure for contributing this interview to World Landscape Architecture. We will be featuring more of her interviews over the next two weeks.